How do we teach our kids to read? It can be overwhelming to even think about it! I’m thrilled to be able to introduce you to a reading programme that is simple for parents to follow at home. The Reading Eggs book packs are fun, will engage your children’s imagination, and are highly effective! This blogpost is a paid collaboration with Reading Eggs. We all want our children to read more, and enjoy the rich world of reading books brings! The best way to nurture this enthusiasm for reading in your home, is to start their experience with books in a positive way. If they enjoy the process of learning to read, they will be eager to pick up books themselves to read in their own time. That is why I believe the Reading Eggs programme is so effective. I have used their online platform for many years with my elder children. Today, I excited to introduce you to their range of books. Reading Eggs have an extensive range of educational products to compliment their online programme. -Mini Book Packs – each contains 10 readers, a poster, reward stickers and a FREE 14-day Subscription to the Reading Eggs online programme. -Flashcards – durable, allows for self-checking, with full instructions for a variety of games. Their books and flashcards are well made, with high quality printing and binding. Children love meeting the same wacky characters from the online programme inside the books themselves. Sign up for our FREE Resources Library! You’ll get access to HUNDREDS of FREE Educational Resources to use with your family! You have successfully joined our subscriber list and can now access the FREE RESOURCES LIBRARY! Complete the lesson on the Reading Eggs award-winning online programme. Reinforce learning with fun phonics games using their Flashcards. -You want to provide your children with a solid foundation in literacy. -You’re a really busy mum, and you are looking for something that is easy to implement and that your children can do a large part of independently. 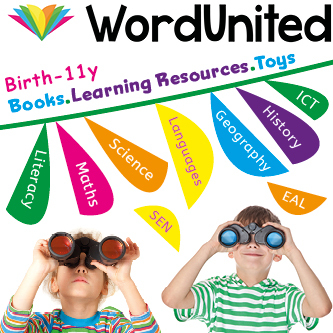 -Your children enjoy colourful and visually stimulating books. -You have children aged 3-6, who are just beginning to read. Using the book sets from Reading Eggs, alongside the online platform, provides a complete learning programme to teach your kids to read. Through this programme your children will learn phonics, sight words, and develop a deep love for reading. insha’Allah. To learn more about the Reading Eggs Books and educational products VISIT THEIR WEBSITE! Thank you for stopping by. I’m grateful to have you here. If you have any questions, pop them for me in the comments below. You can also find me on Facebook, Instagram and Pinterest. LIVE Q & As | Homeschooling, mum guilt, reading & evil eye! This week on the Our Muslim Homeschool Instagram account, I was LIVE answering your questions. It’s a great episode! I’m sure you’re going love it! Make sure you follow me on Instagram so you can watch LIVE! This book had me crying at almost every chapter! We have just finished listening to “Understood Betsy” by Dorothy Canfield through our Audible subscription; and it is undoubtedly one of my favorite children’s books EVER! 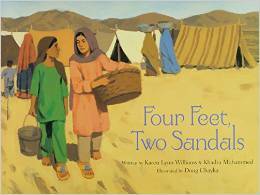 It makes a wonderful family read-aloud and is a part of our Charlotte Mason homeschool curriculum. This blog post contains affiliate links. Please see Disclaimer for more information. “Understood Betsy” is the story of a nervous orphaned girl who is forced to move from her comfortable life in the city, to live on a farm with relatives she has never met. It deals with some difficult topics, like death, illness, abuse, poverty, in a gentle and sensitive way that will not upset young children. This book has sparked so many worthwhile conversations with my kids as we listened to it in the car. As we went on this journey with Betsy, I was taught so much about what being a good parent means, and how to let go of control and trust in your children. It taught us the different ways to show love within a family and how to have integrity and good character in tough times…and so much more! I don’t usually cry in movies or from books, but I cried almost every time we listened to this one..much to the amusement of my boys! Truly a sign of great children’s book is that it can be enjoyed by adults, as well you children. 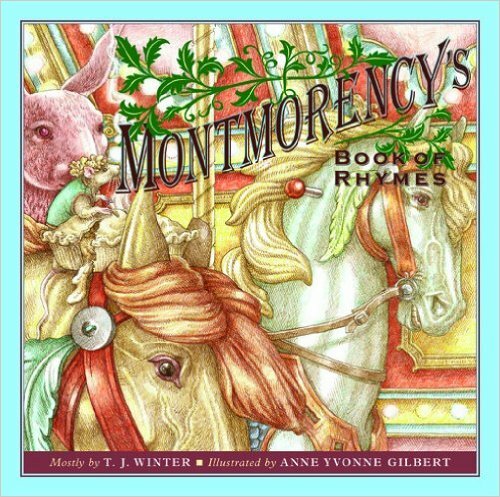 We listened to this amazing work of Children’s literature as an Audiobook on Audible. If you sign up to their 30 day Free-Trial, you can get your first book for FREE; and you can even cancel the trial anytime! We love using Audiobooks in our homeschool, especially when we are driving the kids around to all their activities. It’s a fantastic way to make the most of our time in the car and learn on the go! However, for those of your who would prefer the actual book, this is it! For independent readers – for ages 9-12. Seriously, I love this book. I will be listening to it, and re-reading it in my own time insha’Allah. It is a classic that I hope you will consider for your family. Online learning games are an effective method of improving children’s literacy skills and increasing their confidence in reading. For years I have been using Reading Eggs in our home to teach the children to read. You can imagine my delight when Reading Eggs reached out to me and asked me to review their online reading programme! My children have enjoyed and learnt so much from Reading Eggs and I am so excited to have the opportunity to share that with you here! This blog post has been written in collaboration with Reading Eggs, who gave my family free access to their online Reading programme and compensated me for my time. Why do I love Reading Eggs? The answer is simple…it works! I have used reading eggs with both my sons from the age of 4. After beginning the programme, I witnessed their literacy skills improve tremendously in a short space of time and, most importantly, their enthusiasm for reading grew! Reading eggs is so much fun and it works! Reading Eggs is an Award-winning online reading programme for children aged 3-13. It is a safe online learning environment that gives children access to hundreds of reading lessons, thousands of interactive activities and over 2500 e-books! Reading Eggs have also recently launched a Reading Eggs Junior, which is a new online learning programme for toddlers (ages 2-4) to introduce younger children to letters and pre-reading skills through songs, picture books, interactive activities and videos. It’s a lot of fun! Checking with their big brother! Reading Eggs has been cleverly created to allow children to maneuver their site with little need for grown-up assistance. My children were easily able to progress through their lessons without my help, and soon worked out how to access all the other features of the programme. Nothing hinders learning more than a lack of confidence. I have seen this in my own home. However as our children became more fluent in reading and progressed through the various levels of Reading Eggs, their confidence grew! Reading Eggs is so effective at teaching reading because its is fun. From my experience, I found my kids wanted to do their reading lessons and were disappointed if, for some reason, they couldn’t do it one day! My eldest son really enjoyed the phonics songs and the interactive nature of the lessons. My youngest son loves the reward system they have in place! After completing the lessons, the children are rewarded golden eggs that can be exchanged for virtual prizes. This was a great incentive for him to work through the various levels. He loved completing his lessons so he could fill his virtual house with all the prizes he had won! It’s wonderful to know that whilst they are playing and having fun, they are learning to read! Let’s be real for a moment! Online learning is not only an effective method of teaching children, it also has real benefits for homeschooling parents. It gives me time to do other much needed things; like putting on the laundry, preparing lunch, teaching my other children, or just unwinding for a moment with a cup of tea! Reading Eggs are currently offering a 4-Week Free trial in USA and a 5-Week FREE Trial in U.K.! Online learning is a fantastic means for parents to educate their children at home. Reading Eggs is an incredible programme and resource, and I would genuinely encourage you all to visit their website to see if their programme would work for your family. If you have any questions about how we incorporate Reading Eggs into our homeschool curriculum, or if you have any queries about the programme itself, please leave me a question in the comments below. What we’ve been Reading + GIVEAWAY! I’ve just discovered the world of BookTube and I’m thrilled to make my first ever Reading wrap up for YouTube! In this video I share what books we’ve been reading this month in our homeschool, and what we are planning to read in July. I’m also hosting another GIVEAWAY to win two fabulous books; scroll to the bottom for this post for more details! This post may contain affiliate links. See Disclaimer for more information. To find out what books we’ve been enjoying this month,and what we plan to read next month, WATCH THIS VIDEO! This month, I am thrilled to be sharing two of my favourite books this month. Three further runner-ups will be randomly selected. Each will receive a Big Reconnecting Self Love Journal. This Ramadan Basket Giveaway will run from Sunday 9th July 2017 until Monday 17th July 2017 at 12am GMT. All entrants under the age of 18 must have parental permission to enter. Please be aware that if you are entering from overseas, you may be liable to pay customs tax (or the equivalent), so please check before entering. You can enter by following the directions in the Rafflecopter widget posted below (click HERE is you would like to know more about Rafflecopter). I’ll announce the winners on THIS blog post and contact them directly through email. The winner has 24 hours to respond, otherwise I will have to select another winner. It just me, or do very few homeschooling methods refer to little ones being in the mix of a typical homeschooling day? One of the things that has drawn me to the Charlotte Mason method, especially in the season of life with three kids 6 and under at home, is how welcoming it is for young children. Not only is there a focus on letting children have lots of time for free play, exploration, and short lessons, but she even addresses the youngest of children in her book Home Education. Using Charlotte Mason as a guide, our homeschool is just in the very beginning stages of formal learning. No formal lessons are to start before age 6, but let’s not confuse this though with the idea that we do not teach a child anything. Instead, a child learns from their environment. How? Ms. Mason spent a good deal of time in Home Education explaining what an ideal day looks like, and how one should spend hours out of doors each day, even up to 6 hours a day. What do you do during that time? She gives a lot of guidance, and adds that we shouldn’t bring a story book to read. Instead, the child should be fully engaged in playing and exploring. It’s not like there isn’t enough for them to do! Also, the mother should not be giving lots of instructions or information while they are outside, but rather a small nugget of information, or pointing out something interesting in nature from time to time. Overall, her advice is to let the child’s mind have time to think and process what is around them. A game she suggests to hone the habit of attention from an early age is this: While the children at a park or nature reserve, ask them to go and look at something, maybe a house or farm, and remember all that they can. The child should come back and retell it to you in the most detail they are able. It’s fun for children if mom takes part in this game from time to time as well! 6 hours is a lot, and unless I get a meal in the crockpot before I go, that’s not something we can always do. Of course, 3 hours is better than 2 and 2 hours is better than 1. Do what you can. Especially if you have a small child that needs to nap, don’t beat yourself up over not spending 6 hours a day outside. Ms Mason makes no question about it: habits are the foundation to a strong education and personal life. Without them, we flounder without direction. I wish I would have been turned on to this idea far sooner in my life, and as such, I have to believe that helping my young children build habits might be one of the best gifts I give them. Even as young as an infant, she mentions the value of habits. We know that a toddler who is in the habit of using the potty from an early age, whether they successfully use it or not, is more likely to be fully potty trained earlier than a child who is introduced to the potty haphazardly. For young children in the modern age, it’s not hard to get them started with simple things like emptying a dishwasher, putting their clothes away, and picking up their toys before they go to bed. When it becomes part of the natural rhythm of their days, they don’t fight it as much as a random command when Mom just can’t take the mess anymore. When my oldest daughter was young, in the early 00’s, there was no pressure on parents for kids to learn to read before Kindergarten. It was generally expected that in Kindergarten kids would learn their letters and numbers formally for the first time. Now, just 10 years later, the conversation is completely different. Now kids are expected to have a foundation of reading before they reach Kindergarten. So often I read moms in groups sharing their worry and stress about their 3 year old not knowing their letters. Either the tide is turning again, or it’s just the circles that I’m surrounded in, but the philosophy Charlotte Mason has of waiting until the child is 6 before teaching them to read is catching on. Waiting to teach children formally does not mean that we don’t teach them anything at all. Naturally, numbers and letters come out in day to day life and there’s nothing wrong with pointing out things like what a road sign says or letters in their name. What is encouraged though, is to leave the worksheets and easy readers until the child can be successful with them right away. Let learning be a joy for them instead of building the idea that learning is a struggle. With my own 4 year old, she knows some letters and most of her numbers. While my 6 year old is working on her own lessons, I may give my younger kids wipe clean books and white board markers. The wipe clean books have letters and words in them, and we’ll point out sounds that letters make, but she’s never tested on it later. The information is presented, and if it is worthwhile to her, she’ll try to remember it. As for numbers, my Kindergartener knew her numbers, but didn’t have much number sense before we started Right Start Math. Since my preschooler usually sits with us for math lessons, she has picked up on things a little earlier, but again, she’s not tested on any of this at any time. First and foremost, building strong habits and morals are the core purpose with young children. Ms. Mason did not direct attention to anything more than she did to habits throughout her book Home Education (which focuses on children under 9 years old). Your purpose as a parent and educator is not to fill their minds with information, but rather to build character traits as best you can in them so they can be effective students when it is time for them to study in a more serious manner. In regards to education, the purpose of the young years with the children is not about memorizing letter sounds or math facts. The entire purpose of creating an environment where children are exploring (ideally mostly out of doors) is for children to build a love of learning. Formal lessons should be enjoyable to them when they get to that stage, and something they look forward to when they are young. Shannen is an American Muslim convert, homeschooling mother to 4 daughters and mediocre housewife. She enjoys blogging, knitting, quilting, and avoiding housework. Read more on her blog about their Islamic homeschool, green(ish) living, and the ups and downs of parenting. You can connect with Shannen on Facebook, Instagram, and Pinterest. How to Teach your Four year old to Read…if they want to! Learning to read is one of the most important skills our children will ever learn, yet as parents, most of us have no idea how to begin! 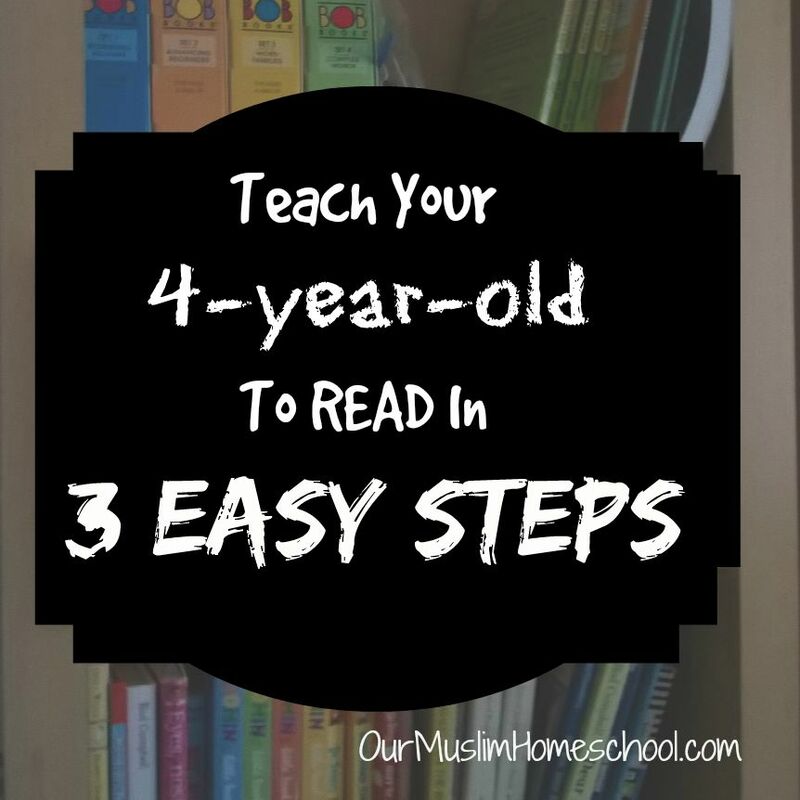 Keep reading and I will walk you through the 3 simple steps and show you how to teach your 4 year old to read! This blogpost contains affiliate links. See Disclaimer for more information. This article is written from my own experience. By the age of 4, my son was reading fluently. Now at 5 years-old, he can pick up almost any book, read it and enjoy it. At the moment he’s especially keen on our encyclopedia! And that’s what it’s all about for me; opening up the world of books to them whenever they’re ready. Whether you home educate, or your children go to school, these simple steps will help you to teach your 4 year old to read. insha’Allah. Not all children are developmentally ready to read at 4 years-old. PLEASE PLEASE don’t force a child who is not ready!!! It will do more harm than good! If a child love books, the he will love to read. If he loves to read, he will love to learn. Insha’Allah. A child who is self-motivated will learn to read, and learn any other skill that they want to learn, much quicker and more easily than a child who is not self-motivated. If you have to force your child to read, it will be much harder for both of you, take longer, and may even cause your child to dislike reading altogether. So how can you encourage this self motivation? There are several ways that you can nurture a passion for reading in your children. Set aside time everyday to regularly read aloud to your children. Make that time special for them. Cuddle up under a blanket by the fire, drink hot chocolate or just let her sit on your lap. She should look forward to that time with you. Make it magical. Give her your undivided attention, full of your love and affection, and read her incredible stories that will feed her imagination. Fill your home with as many books as you can afford. There should be a small collection of books in every room for your children freely to look at. If you have space, you may even make a little ‘reading nook’ for your home, a specially designated space, used only for reading and enjoying books. However you decide to implement this principle, it will teach your child to give importance to books, and thereby give importance to learning and seeking knowledge. Trips to libraries and other places of knowledge can show your kids that your family’s passion for reading is not in isolation, but there are many like minded people who share your enthusiasm. When they see other children excited by books, they will join in! If your television is on all day, the books will most likely be left on the shelves. Not only is TV highly addictive for small children, becoming a bad habit that is hard to break, but it will also teach them that the TV is important; and more worryingly, that what the TV says is important! There are many benefits to turning off the TV, but the most relevant to this article is that it WILL cause your children to read more. I have seen it in my own home. With no other distractions, children will pick up the books you have put in each room and read for fun. My children do have restricted daily screen-time, but I work hard to make sure that the TV and other devices are off for most of the day. So, even if you can’t remove the television completely, try to at least restrict how much TV they watch. Limit the hours that the television is put on, and keep it off the rest of the time. STEP 3: Buy the right books! If you feel your child is ready to start learning to read (often referred to as Reading Readiness) you will need to invest/borrow some books to help you to begin. A primer teaches the rules of reading, beginning with the phonetic sounds of each letter. It then progressing to blending, through to difficult multi-syllabic words. By the time your child finishes one of these primers, you can be completely confident that they can tackle any other book out there. 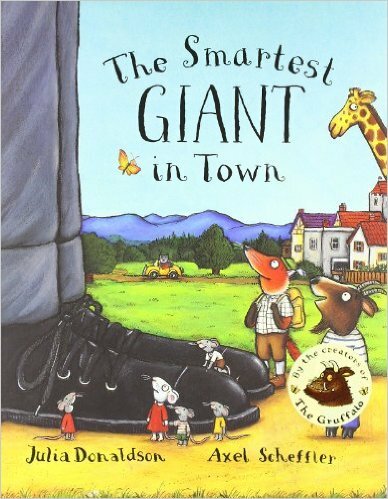 Although the books above are printed in the U.S. they are suitable for children in the U.K.
Once your child has learnt the sounds of the letters, they can also begin reading short books called ‘Easy Readers’, whilst continuing the later lessons in the primer. For the early stages I would recommend the easy readers: Bob Books First! Having progressed through one of these box sets you can move onto more challenging readers. There are many sets and curriculum available that you can follow if you wish. My advice would be to choose books according to your child’s interests rather than following a rigid curriculum. Whether its fairies, cars, horses or monsters, there are a multitude of easy readers available to buy online and borrow from the library. Do not worry that you are not completing every book in the series, or reading them in the correct order, because if you are working through a primer, then your child will not miss any of the ‘rules’ they need to know. What is more important at this stage is that they continue to love reading and books, and the act of reading does not become a chore to them. After the ‘Easy Reader’ stage they can read anything they want to, with some guidance from Mum! Related: Day in the Life | What Homeschooling is REALLY LIKE! If at any point your child seems to loose interest, just take a break for a few weeks. Pinterest is full of fun activities for you to do with your child to improve her reading skills without opening up a book. She will be learning to read without realising it! On those days when the kids are sick, or they just don’t want to cooperate, we love using Reading Eggs, an online reading programme full of games and songs. Related: Full review of the Reading Eggs programme HERE! At this young age it is vital that you remain flexible and take a relaxed approach to teaching reading. Make it enjoyable and have fun! So that How to Teach your Four-year-old to READ in 3 Easy Steps! Of all three steps it is step one, instilling a love for books, that is the most important. Without it you will face a constant struggle with your child, in an effort make them cooperate and do something they have no desire to do. If they love books, they will want to read. Please leave me a comment below and tell me how you are teaching your children to read. What resources have you used? What are some of your children’s favourite books? To make sure you don’t miss the next blog post, Subscribe to my mailing list. For a daily look into our family life and see how we homeschool, follow me on Instagram. Follow me on Twitter or Facebook for more about Islamic parenting, homeschooling and being a Muslimah mum. Thank you for visiting our blog! Come again soon! Please remember us in your duaas. 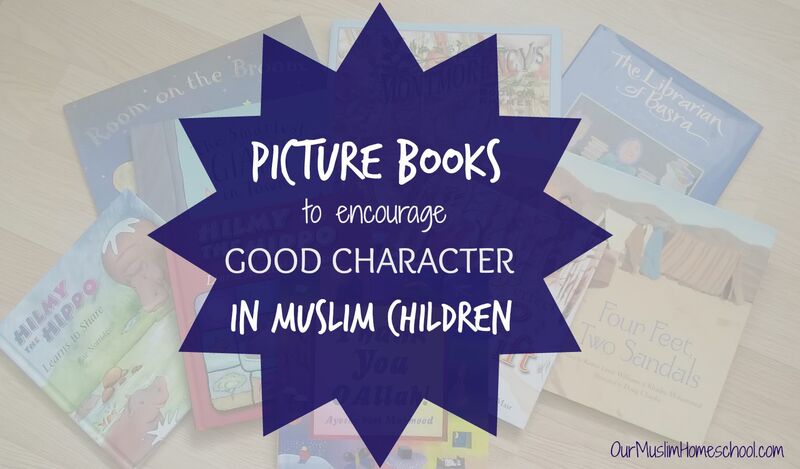 books that encourage upright character and good morals. These books do NOT contain the stories of the Prophets (pbut) but are works of fiction. Truly the best of characters was that of the Prophet Muhammad (pbuh), and the other Prophets of Allah (pbut), and to them we should look for the best example. 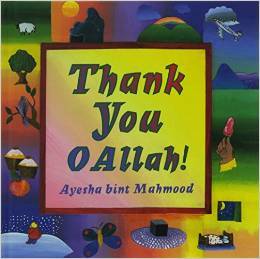 A list of my favourite Islamic children’s books will be published soon insh’Allah. This is NOT a sponsored post. These are genuine recommendations and are books that I read to my own children. marked with a (M) are specifically targeted at Muslim children. T.J. Winter (Shaykh Abdal Hakim Murad) has written this charming collection of rhymes. 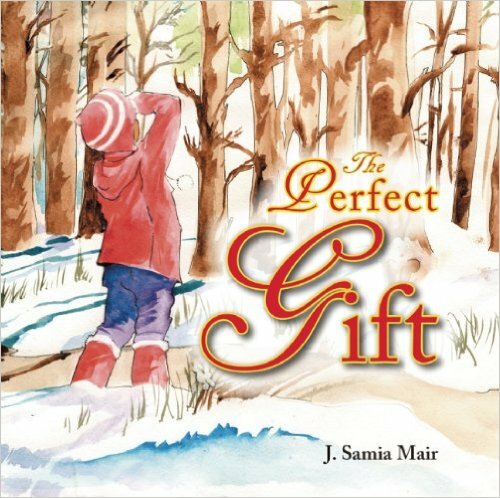 With it’s fantastic characters and beautiful illustrations, rich language, and subtle moral undertones, it is a timeless classic that should be a part of every Muslim child’s collection. A heart-warming story of two girls and their friendship in a refugee camp in Pakistan. 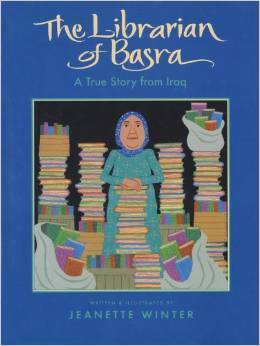 Based on a real story, this is the tale of a librarian’s struggle to protect the city’s books during the war in Iraq. One cannot help but be moved by her love of knowledge and literature. 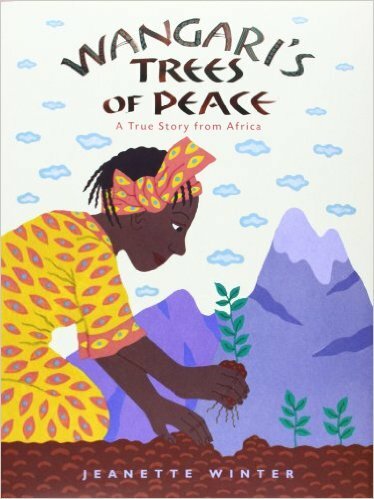 Based on a real story, a woman’s fight to save the trees of Kenya, and restore the natural order in her homeland. A fun and silly book, for those fun and silly moments! George wishes he wasn’t the scruffiest giant in town, so he buys himself a new outfit..a new outfit that will help a lot of other animals in ways you wouldn’t expect! 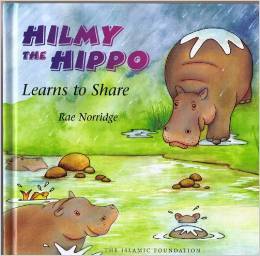 This series follows Hilmy the hippo as goes on adventures, learning from his mistakes a he goes. A story about appreciating nature and living in submission to Allah. This book is aimed at children under 6. It encourages gratitude to Allah for all the blessings He has bestowed upon us. What books would you add to this list? I would love to know. Please leave me your recommendations in the comments below. For a daily look into Our Muslim Homeschool follow me on Instagram, Twitter or Facebook. It’s that time of year again…and I love it! 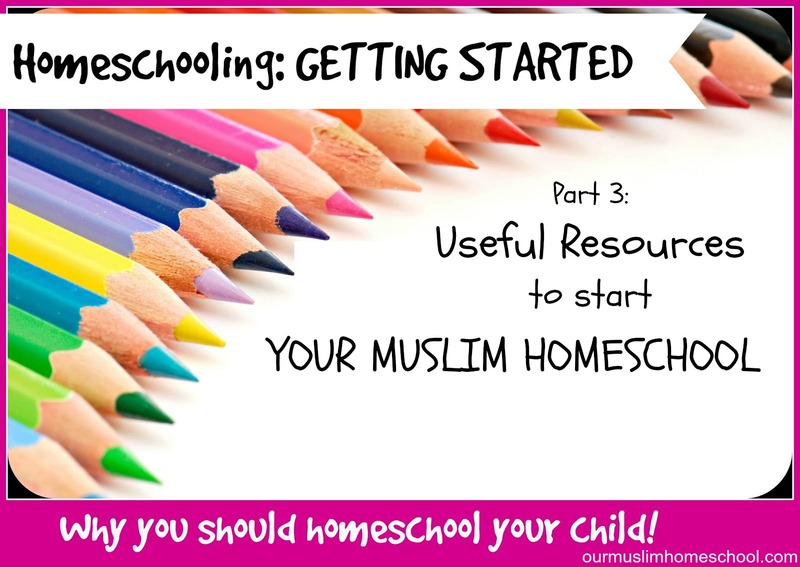 It’s time to plan next year’s Curriculum for Our Muslim Homeschool! Like most homeschooling families, I started planning for the next year of home education at least 6 months ago, and have been slowly collecting different resources as I find them. This is what we are going with this year! This blog-post contain affiliate links. Please see Disclaimer for more information. My children are 5 and 3 years old. Below I have listed the curriculum we will be using for M as he starts Year 1 (Kindergarten) from September. For A, my pre-schooler, we will not be following a set curriculum, but will draw ideas from few different books, which I also have listed below. The books listed below are the ‘main’ texts we will be using, but we will also draw from many other resources that we have at home; as well as online and from our library. We also enjoy frequent field trips! If you are interested in any of these books, just click on the title of the book for a link to Amazon or the relevant website.Please note: This does not include our reading list, i.e books (fiction) that M will read or will have read to him. 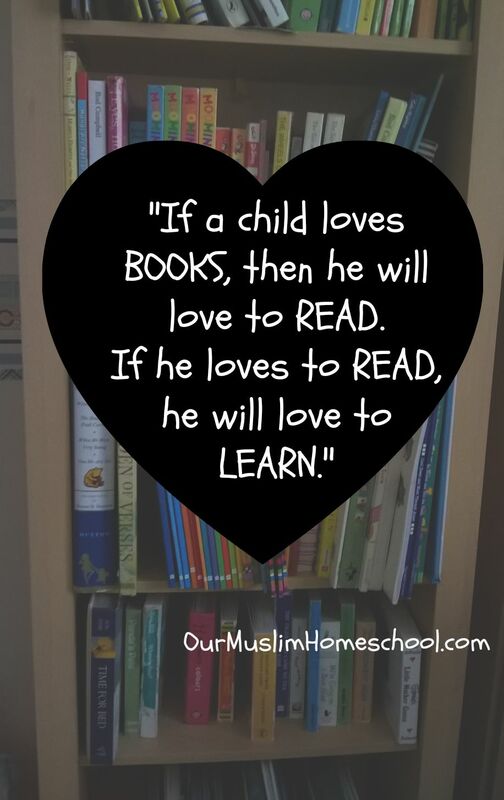 I hope our curriculum helps to inspire other Muslim Homeschooling Families, as so many others have inspired me! For this year we will follow an interest-led approach for the humanities. By this I mean that we will have a relaxed approach to these topics, studying what-ever M wants to learn about using books from our local library. These books provide me with ideas for preschool activities and learning games. They are a great resource! 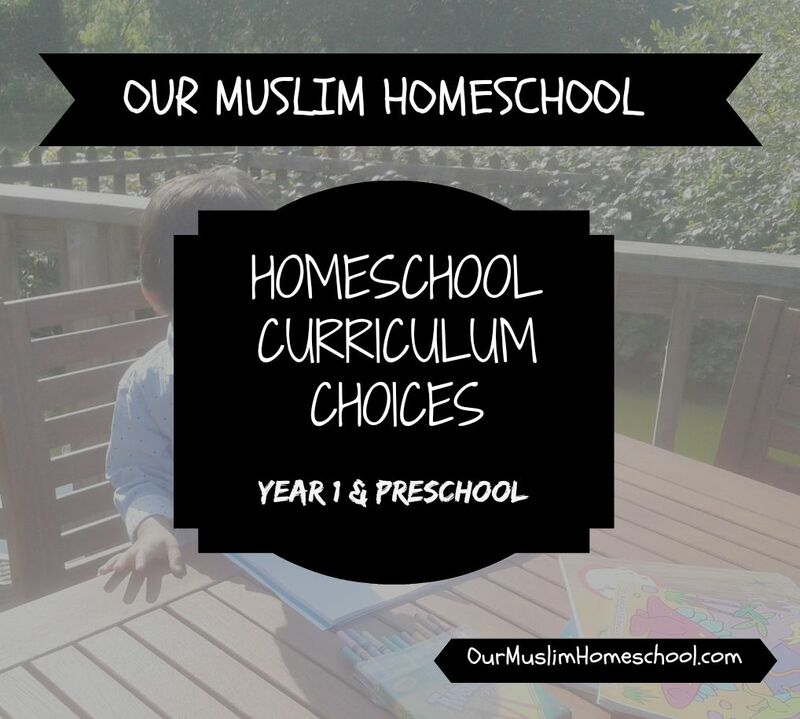 If you would like more ideas for Curriculum choices, particularly for older children, I would recommend visiting Noor Janan HomeschoolandIman’s Home-school; both great resources for Muslim Homeschoolers. To make sure you don’t miss the next in the series, please Subscribeto my blog, or follow me on Instagram, Facebook or Twitter. If you have any questions, or any ideas for future posts, please leave them for me in the comments below. If you have a blog post about you homeschool curriculum. please feel free to link it below. I’d love to know what your using! 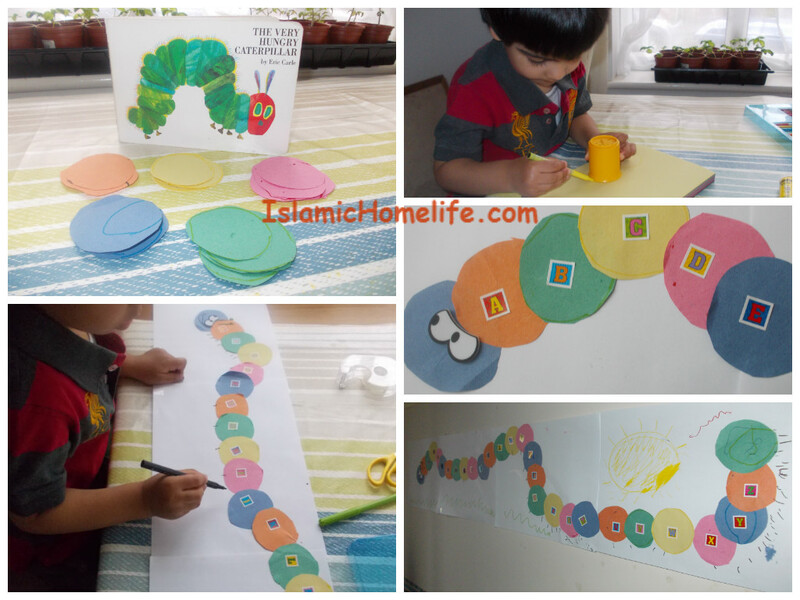 This homeschooling activity was inspired by the book ‘The Very Hungry Caterpillar’ by Eric Carle. This preschool activity helps with letter recognition, putting the letters in the correct order, sequencing, as well as letting the lil’ ones be creative and have some fun. Begin by having you child draw around a circular object, like a cup, to create at least 27 circles. We used lots of different coloured paper, to make it more interesting. Then either cut the circles out yourself, or let him/her have a go. In my case I did most of the cutting myself as Dino-boy is still a little young. Next ask you child you put glue the circles down in a particular order (Blue, green, red, blue, green, red etc.). I was amazed at how excited Dino-boy got by this exercise. It was wonderful to see. Then draw on /stick on the eyes. We had some foam eyes left over from another craft pack, so we used them. It gave our caterpillar a rather menacing look! Then I asked Dino-boy to stick some alphabet stickers onto the caterpillar’s body, in order. In hindsight, it may have worked better if the stickers were stick on first, before each circle was glued down. However, both achieve the same learning outcome. If you child is older, you cold have them write out the letters on each circle. Next, we drew on the legs. Technically a caterpillar has only 6 legs, so I guess ours is more like a millipede! Then we added some grass and a sun, and got a bit creative!